An affirmation in law is a solemn declaration allowed to those who conscientiously object to taking an oath, such as members of the Society of Friends (Quakers). 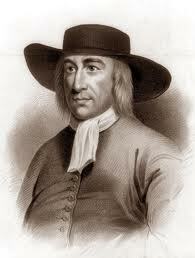 Quakers believe in speaking the truth at all times, and so the act of only swearing to truth in court, rather than in everyday life would imply double standards. Thus they refuse to swear an oath in a court of law. Be pat­terns, be examples in all coun­tries, places, islands, nations, wherever you come, that your car­riage and life may preach among all sorts of people, and to them; then you will come to walk cheer­fully over the world, answer­ing that of God in every one. I can categorically state, if anyone is interested, that I have not and will not speak with members of the press or parents about the cuts to the Outreach services in East Lothian. and which inspires me and gives me a meaning to life. In a letter to parents of children with reading problems, Maryanne Wolf explains how dyslexic children’s brains are organised differently. Although it’s long I’m reproducing it in full as it is so powerful. No one can ever prepare a parent for two things: the immeasurable love that comes with having a child; and the sorrow and confusion that comes when your child appears to learn in a different way from other children. I am an educator and neuroscientist, who studies how the brain learns to read and what happens when a young brain can’t learn to read easily, as in the childhood learning challenge, developmental dyslexia. Yet, despite this knowledge, I was unprepared to realise that my first son, Ben, was dyslexic. He was five years old when I put all the pieces together, and I wept as soundlessly and deeply as every other parent. I wept not because of his dyslexia, which I understood very well, but because I knew the long, difficult road Ben faced in an educational system ill-prepared then to meet his needs. That was the first thing I did 16 years and eight schools ago. The second thing was to concentrate my work on ways to help our society understand two huge things: first, the complex, unnatural miracle that takes place every time a brain learns to read; and second, the fact that many children with dyslexia have a different brain organisation – one that poises them for greatness in many areas; but makes them inefficient at learning written language. Helping every child meet his or her potential, not only children with challenges, is the underlying goal of this letter, my new book Proust and the Squid: The Story and Science of the Reading Brain, and the work of my entire field. It all begins with understanding that reading does not come naturally to human beings. We humans invented literacy, which means it doesn’t come for free with our genes like speech and vision. Every brain has to learn it afresh. Learning to read for the brain is a lot like an amateur ringmaster first learning how to organise a three-ring circus. He wants to begin individually and then synchronise all the performances. It only happens after all the separate acts are learned and practised long and well. In childhood, there are three, critical “ring acts” that go into the development of reading: learning about the world of letters; learning about the individual sounds inside of words (which linguists call phonemes); and learning a very great deal about words. Many things help each of these three areas develop, and parents and loved ones can foster them all. The most important contribution appears deceptively simple: speaking and reading to your child from infancy onwards. Children who spend the first five years of their lives exposed to a great deal of oral language with others (and not from a television or other media) and listening to a great many books being read to them enter kindergarten with advantages that prepare them to read. In one well-known study, children in more privileged language- and book-rich environments heard 32m more spoken words than children raised in disadvantaged environments. It was not economic poverty, but “linguistic poverty” that put these children at profound risk for failure before they entered the kindergarten door. In dyslexia, the reasons for reading difficulties aren’t that simple, or as easy to prevent. Somewhere between five and seven years of age, most young brains are readied to become their own ringmasters and bring all their knowledge about letters, sounds and words together to read. For children learning the alphabet, they must learn that a particular sound corresponds to a particular letter, which in English isn’t always as straightforward as in other languages. Thus, programmes that emphasise the principles of phoneme awareness and decoding (that is, systematic phonics programmes) represent an important foundation for all children first learning to read. There are, of course, other linguistic areas that must also be emphasised, including vocabulary knowledge, familiarity with how words work grammatically, and also knowledge about the smallest units of meaning in English, called morphemes. Ideally, our children need all of these emphases when learning to read. In dyslexia, many children have particular difficulties distinguishing the phonemes or sounds within words. That makes it very difficult for them to learn the rules for which particular letters go with which sounds. Other children with dyslexia aren’t able to acquire the speed necessary to get the different parts in the reading system together; they never learn to read fast or fluently enough to comprehend what they read. Brain imaging studies are beginning to suggest that these difficulties may emerge in part because many children with dyslexia are endowed with a very strong right hemisphere that they use to read. In most people the left hemisphere is largely used in reading. The right hemisphere, which is involved in many spatial, artistic, and creative functions, is, however, very inefficient for reading, which would explain why it takes so long to learn to read. If this research proves correct, it also helps explain why so many great, creative figures have a history of dyslexia: artists like Picasso, Gaudi, and Rodin; writers like Yeats and Agatha Christie; and entrepreneurs like Richard Branson, Charles Schwab, and Michael Heseltine. The problem is that no one tells children or their parents, teachers, and classmates that some of the world’s most creative and brilliant minds had similar difficulties learning to read. Most children with dyslexia do not easily learn to read, spell, or write, and they believe this means they must be “dumb” (their classmates’ description), or “lazy” (what many parents think) or “not working up to their potential” (many teachers’ description). Not all children with dyslexia have extraordinary talents, but everyone has a unique potential that is being daily whittled away by this lack of understanding. Maryanne Wolf is the director of the Center for Reading and Language Research at Tufts University. ‘Proust and the Squid’ is a great read. I commend it to you. I have been on Twitter for just over a year now and continue to find it the most amazing resource. It’s like a virtual staffroom where I can access a stream of links, opinions, ideas and resources from an interesting and informed group of fellow educators world-wide. For someone working in additional support needs, dotting between 42 schools, it’s the staff room I most frequently inhabit. And it’s a very special staffroom as there I find people all passionate about their area of interest, keen to learn and share – and support. One could not say that about all physical staffrooms! I have learned more about how to enhance my teaching this year than ever before through Twitter. It’s educational (and a bit of social!) networking at its very best. I hadn’t however given any thought to using Twitter with youngsters. 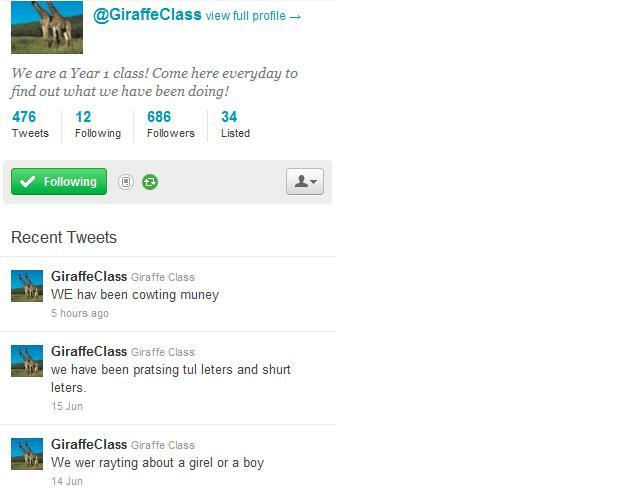 Thanks to @literacyadviser I recently came across a fabulous connection to a class of 5 and 6 years olds who are Tweeting, @GiraffeClass. I gather that a different child has the responsibility to record what the class has been doing that day – as you can see from the screen shot. What a wonderful idea. How delighted the parents must be to see such immediate evidence of thinking and writing and how valuable for the teacher to have such data. This demonstrates to the little ones and their families how their literacy skills are developing. It is also a great method of showing how connected we all are today. Tweeting must also develop the children’s media literacy skills: ‘viewing, analysing and discussing a wide range of texts and using available technologies to create text in different formats’. Later on, the discipline of the 140 characters will help the children to be precise in their writing, teaching them in a very real and unthreatening way that revision of ideas and careful word choice is essential to get your message across. It also encourages development of keyboard skills. Feedback (I don’t really know how that works with Giraffe Class to be honest) can be immediate. There’s nothing more exciting than having your thinking validated by a comment – especially if it’s from someone you haven’t met! Finding this cheered me up no end! John Naughton writes in this week’s Observer about an extraordinarily illuminating app that enabled him to access that intractable poem, ‘The Waste Land’. It’s a digital edition of the poem in the form of a ‘living book’. The publishers, Touch Press, say that such books ‘define the future of publishing’. Naughton thinks they are ‘better described as makers of beautiful things for multimedia devices’. Perhaps this is a sign that a mediating ‘3rd culture’ proposed – ultimately – by C P Snow may be on the horizon. The app provides the full text of the poem as one would expect. In addition, there are interactive notes; a ‘vivid’ film performance and audio recordings of the poem, synchronised to the text; expert video perspectives; and a complete set of facsimiles of the manuscript pages, revealing how the poem took shape. the really eye-opening experience was listening to the poem being read, and following the highlight as it moved through the text…. Sitting there, iPad on lap, it was as though the poem had suddenly burst into life’. a demonstration of the potential of technology to a work of art … Eliot’s poem had effectively been closed off to me for decades. Now it isn’t. This is not The Future of books but The Present. Many of us own Kindles, or other e-readers. But that doesn’t stop us from buying and reading paper too. It seems that sales of books in both manifestations are on the increase. Such apps as John Naughton describes can only add to the gaiety of nations, surely? I’ve just spent another frustrating 40 minutes trying to join a Glow Meet. Don’t get me wrong, I have an emotional attachment to Glow and would love to see it work. I did, after all, make a small contribution to the tender process way back in 2003, so I really wish it well. I was a mentor for a while but that never really took off the ground. I have my own group which I have never made public, not knowing how to go about it. My attempts to use Glow Learn (potentially a very exciting prospect) and Glow Meets linking P7s and S1s all came to nought, largely because there was no perceived need at the other end. As a support teacher you are very dependent on class teachers to run with the ideas: can’t do it in isolation. So I rather lost the will. Mind you, as my service will be defunct in a couple of weeks, I have decided to get as many documents and links in the region’s ASN group as possible before I depart. Let’s hope my time will not be completely wasted. 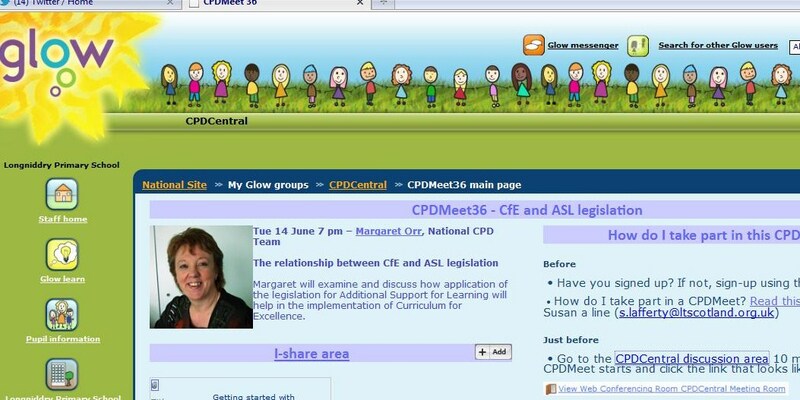 Anyway, tonight’s CDP opportunity aimed principally at supply teachers failed miserably as there was either no sound or terrible screeching despite the presenter, Margaret Orr’s best efforts. We saw her though! I am meant to be giving my presentation tomorrow evening. Let’s hope all the preparation and the effort will not be wasted this time. I’m off to get my belated dinner!